I created this wordle as an experiment using the text from my translation of the Talloq Chronicle, a seventeenth-century historical manuscript from the Indonesian island of Sulawesi. 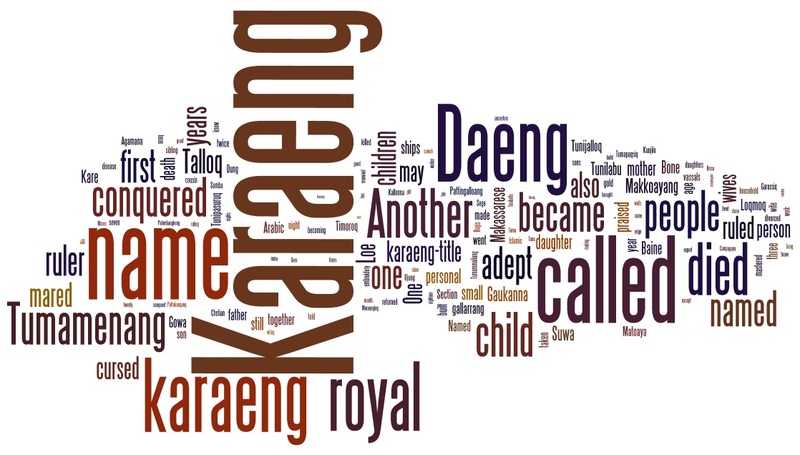 One thing this visual representation does superbly is underscore the intense focus on names and titles – karaeng and daeng are the two main ones – in this genre of Makassarese history. Kinship and other relationships are also important, but decidedly secondary. The prominence of nouns over verbs is also striking, and emphasizes again the genealogical nature and function of the chronicle: to locate individuals in their proper web of ancestors and relatives. What is great about this way of representing information is that of course I knew all this already, but that’s because I spent months reading and translating this text. Someone with no familiarity with the Talloq Chronicle can at a glance gain an intuitive understanding of the social role of this important work. Posted on June 20, 2013 by bilcummings. This entry was tagged chronicle, digital history, gowa, history, indonesia, kinship, makassar, sulawesi, talloq. Bookmark the permalink.